[Lyric Theatre, London: First World War benefit concert.] Programme for 'Ellen Terry's Bouquet', 'In Aid of the Concerts at the Front'. Containing 'Letter from the Commander-in-Chief', Douglas Haig. 11 + pp, 4to. Stitched with pink thread and unbound. In fair condition, lightly aged. Nicely printed on laid paper, with cover illustration in black and green of view from back of stage of dancer receiving a bouquet from an audience. The second page gives details of the performance, with a list of the names of the 'Executive Committee'. The programme is on pp.3-11. Divided into 16 numbers. After five songs, the main feature (numbers 6-15 pp.4-8) is 'Chelsea on Tiptoe | New Version', with 'A Prologue | Written specially for “Ellen Terry's Bouquet” | By E. V.
[Flatbush Motor Corps, National League for Woman's Service, New York.] Programme of entertainment in aid of the Corps, including 'Houdini | The World's Greatest Mystifier' and 'The Celebrated Creator of the Jazz Dance Craze' Bert Kelly. [Flatbush, Brooklyn, New York.] Flatbush Theatre, Church and Flatbush Avenues. 9 December 1918. pp., small 4to. Stapled in brown printed wraps. In fair condition, lightly aged and worn. Title from cover, where it is printed in blue, enclosed in a border of US flags, with clutch of four flags (UK Red Ensign, Cuban, French, US) in blue and red at head. Filled with advertisements, including an illustrated full-page one inside the front cover for 'Dodge Brothers | Convertible Car'. pp., 8vo. On shiny art paper. Stitched with red, white and blue ribbon into cream card wraps. In fair condition, lightly aged and worn. The front cover of the wraps has the signature of 'E. Marshall-Hall' at its head, and is illustrated with a spoof coat of arms, featuring three nurses, beneath the heading 'The P.U.O.'s. (Pierrots of Unknown Origin)'. 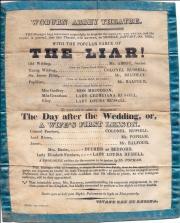 Inside the front cover is a page of spoof advertisements, with in-jokes about the performers, as well as one clearly referring to Marshall Hall: 'I will cure you of the Swearing Habit in 9 days. [ The German Gymnastic School, King's Cross, London. ] Printed programme for its 'Annual Competition [...] Under the direction of Roman von Schweizer, assisted by R. Oberholzer, Assistant Master.' With 'Rules for Wrestling'. Full title: 'German Gymnastic Society's Annual Competition, (Under the Rules of the A.A.A., A.B.A., & A.G.A.) To be held in The Gymnasium, 26, Pancras Road, King's Cross, on Friday, December 12th, 1890, Commencing at 8 p.m. precisely. Under the direction of Roman vn Schweizer, assisted by R. Oberholzer, Assistant Master.' On both sides of a 25 x 15.5 cm piece of card. In good condition, lightly aged and worn, with some light notes to programme in pencil. [ Festival of Britain, 1951. ] Printed 'Festival of Britain | May 3 - September 30, 1951 | Information Summary'. 16pp., 12mo. Stapled pamphlet. In fair condition, aged and dogeared. Cover reads 'FESTIVAL OF BRITAIN | MAY 3 - SEPTEMBER 30, 1951 | INFORMATION SUMMARY'. The lettering of the words 'FESTIVAL OF BRITAIN' is in the distinctive style, and the festival's logo is on the back cover. A list of contents on the second page includes an introduction on 'The Festival Organisation', information on events around Britain, 'Travelling Exhibitions' (including the 'Festival Ship Campania'), 'The Churches' Participation', and sections on books, films and 'Admission Charges'. [ Printed pamphlet. ] The Official Programme of The Tercentenary Festival of the Birth of Shakespeare, To be held at Stratford-upon-Avon, Commencing on Saturday, April 23, 1864. Also, An Account of what is known of the Poet's Life; [...]. At London: Imprinted for Cassell, Petter, & Galpin, at the Belle Sauvage, in Ludgate-hill, near Paules Church-yard. 1864. The full subtitle reads: 'Also, An Account of what is known of the Poet's Life: a Guide to the Town and Neighbourhood of Stratford-upon-Avon And sundrie other matters just now of publicke interest relating thereto.' 96pp., 8vo. In red printed wraps. Pp.79-96 carry advertisements, as do the wraps, and there is also a leaf of advertisements on red paper inserted at rear. Aged and spotted, in brittle and worn wraps with slight loss to extremities. Illustrations in text. At head of front cover: 'Published under the Authority of the Committee.' Several copies on COPAC, but now uncommon. [ Val Gielgud and Nicholas Vane. ] Unpublished Typescript 'Death Comes to the Hibiscus. A New Play by Val Gielgud and Nicholas Vane'. 'Val Gielgud | Broadcasting House [ BBC ], London, W.1.' and 'Nicholas Vane | (Francis Durbridge) | c/o Christopher Mann Ltd, 45, Fountain House, Park Lane, London, W.1.' Undated [ circa 1941 ]. 149pp., 4to. Carbon copy. On rectos of leaves only, and bound in a buff card folder with metal clasps. Internally in good condition, on lightly-aged paper, in worn binding. The play centres around 'the "Hibiscus" night-club, one of those London resorts which are alike the despair of Social Reformers and the delight of the Forces when on Leave. It is situated somewhere between Berkeley Square and Dover Street.' The typescript is clearly an actual play and not a radio play, but there is no record of it having been performed on stage. [ Ye Sette of Odd Volumes, London. ] Four programmes/menus of meetings, nicely printed and illustrated (three by Rupert Thomas Gould). [ Ye Sette of Odd Volumes, London. ] One: 'holden at Ye Imperial Restaurant (Oddenino's)', 30 October 1923. Two: Royal Adelaide Gallery (Gatti's), 22 June 1926. Three and Four at the Savoy, 24 April 1928 (Curwen Press), 27 June 1933 (Pelican Press). One: 'Ye 390th Meeting of Ye Sette of Odde [sic] Volumes, holden at Ye Imperial Restaurant (Oddenino's) on Tuesday, ye 30th daie of October, 1923.' 4pp., 4to. Bifolium on shiny art paper. In fair condition, with light signs of age and wear. Stylish caricature portrait of chairman Sir William Arbuthnot Lane ('Chirurgeon') on front cover, with two amusing small vignettes. TWO: 'Ye 415th Meeting of Ye Sette of Odd Volumes, holden at Ye Royal Adelaide Gallery (Gatti's) on Tuesday, ye 22nd daie of June, 1926.' 4pp., 8vo. Bifolium on shiny art paper. [ Programme for a procession of yachts at Cannes, before Félix Faure, President of the Republic. ] Ville de Cannes. Union des Yachts Français. Défilé des Yachts devant M. Félix Faure, Président de la République. Cannes [ French Riviera ]. 3 March 1896. 4pp., folio. Bifolium. On aged and creased paper, with slight damage at spine. Tastefully laid out. The front page carries the Programme (from 'A 8 heures: Arrivée de l'Escadre devant Cannes.' to 'A Midi: Départ pour Villefranche. '), the two central pages carry the 'Règlement' (19 articles under the headings 'YACHTS A VAPEUR', 'VOILIERS', 'VAPEURS PORTANT DES PASSAGERS' and 'PLAISANCIERS & EMBARCATIONS DIVERSES') by 'Le Commissaire de l'Inscription maritime, | BLANC' and 'Le Maire, | HIBERT'. The whole of the last page is taken up with a lithographic map of the route ('LITH ROBAUDY CANNES'). [ Buckingham Palace concert programme. ] Printed programme for a concert by 'Mesd[am]es Adelina Patti, Kellogg & Trebelli' and others, conducted by 'Mr. W. G. Cusins', featuring music by Liszt, Wagner and Max Bruch. 'Monday Evening, 16th June, 1879.' Ortner & Houle, 3 St James's Street, London SW. Printed on one side of a piece of 4to paper, with thick embossed decorative border in imitation of lace. In fair condition, on aged and worn paper, with closed tears to frail border. Royal crest at head printed in gold and other colours and also embossed. Headed: 'BUCKINGHAM PALACE. | MONDAY EVENING, 16th. JUNE, 1879.' Fourteen pieces are listed, by Mendelssohn, Liszt, Wagner (2), Gounod (2), Bizet, Max Bruch, Rossini (2), Ambroise Thomas, Massenet, Schumann and Cimarosa. Apart from Patti, Kellogg and Trebelli, the performers are 'Herr Henschel', 'Mr. W. H.
[Printed programme of 'The last Monday Popular Concert ever given'.] Prof. Johann Kruse's Concerts. St. James's Hall. [...] Monday Popular Concerts. [...] (Under the Direction of E. L. Robinson) [...] Analytical Notes By Dr. Ernest Walker. [London, 1904.] ['Sole Lessees Chappell & Co. Ltd. [...] Forty-Sixth Season, 1903-4. [...] Twentieth Concert of the season. Mar. 28th, 1904, at 8 o'clock punctually'.] Miles & Co., Ltd., 68-70, Wardour Street, W.
16 pp., 8vo. In printed wraps with advertisements of performances at the Queen's Hall on the back cover. Stapled. Aged and damp-stained, with chipping and wear to edges. Punch hole at head. Pp.2-16 carry Walker's notes on the five sections of the concert: a Beethoven quartet performed by the Kruse Quartet; Berger songs performed by Mrs Henry Wood, accompanied by her husband; a Brahms piano piece performed by Willibald Richter; Borodine songs performed by Mrs Henry Wood, again accompanied by her husband; and a Sinding quintet performed by Richter and the Kruse Quartet. [Maurice F. Strong of the United Nations Environment Programme.] Two Typed Letters Signed to the English environmentalist Arthur Bourne, with typed copies of five letters from Bourne to Strong. Strong's letters both from Geneva, on letterheads of the United Nations Conference on the Human Environment, 29 August 1972, and the United Nations Environment Programme, 26 July 1973. Four of Bourne's drafts from Flitwick, Bedfordshire, 1972-1975. The seven items are in good condition, on lightly-aged paper. Strong's two letters are each 1p., 8vo, and are both on thin paper with slight wear to the edges; the second letter is docketed on the reverse by Bourne. In his first letter Strong congratulates Bourne on 'the new journal "The Environment This Month"'. He was 'favourably impressed with the first issue' and congratulates Bourne 'on the initiative you have taken in filling in such a promising way the need which existed for a high quality international journal on environmental affairs'. Mimeographed Typescript of 'Stanley Morison: 1889-1967. A Radio Portrait. Compiled by Nicholas [sic] Barker and Douglas Cleverdon.' Transmitted on the BBC Third Programme. [BBC Third Programme, London.] Recorded on 24 January 1969. Transmitted on 2 February and 6 March 1969. + 23pp., foolscap 8vo. On 24 leaves attached in one corner by a metal stud. The title page carries the reference TM144D, and states that the producer was Cleverdon, and gives times of transmission, rehearsal and recording, with 'R.P. REF. NO.' and the details of the secretary who typed out the document. The piece was narrated by Barker, with the 'Speakers' are named as Burns, Carter, Crook, Crutchley, Meynell, Pollard, the Stones and Warde. [Printed programme of concert by Mischa Elman, Madame Sobrino and Charlton Keith] Holmesdale Fine Arts Club. Season 1906-7. First Concert At the Public Hall, Reigate, Friday 23rd November, 1906. At 8 Punctually. Carriages 10 o'clock. Holmesdale Fine Arts Club, Reigate, Surrey. [C. Allingham, Printer, Reigate.] 1906. 8pp., 12mo. Stapled into beige wraps with deckled edges, with attractive illustration of street musicians on front in brown and red. In good condition, with rusting to staple having loosened the central bifolium. A pleasing memento of an early concert by Elman (he was fifteen at the time). Pp.4-8 carry the 'Words of the Songs'. 'At the Piano - Mr. Charlton Keith. Piano by Bechstein. Suppied by Mr. Arthur Wood, Redhill.' Scarce: no copy on COPAC. Printed programme of a concert by Albert Sammons, 'Assisted by Olive Goff (Soprano) | Gerald Moore (Pianist)', with cover photograph of Sammons signed by him, and containing an advertisement for Columbia New Process Records. 'Programme and Book of Words SIXPENCE. L. G. SHARPE, 25, Haymarket, S.W.1.' Undated. 8pp., 12mo. On shiny art paper. On aged paper, with the two staples rusted. Sammons has signed over the cover portrait of him by 'Haile, Bognor', 'Sincerely Yrs | Albert Sammons'. Including texts by Mary E. Coleridge, Lord Lytton and Sir Rabindranath Tagore. Central opening carries an advertisement stating that 'ALBERT SAMMONS Records ONLY for COLUMBIA Records', with list of eight 'Recent ALBERT SAMMONS Records'. 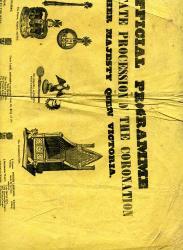 [Printed programme.] 'Mr. George Riddle will give a course of six afternoon readings' [at the Brooklyn homes of Mrs N.W.T. Hatch, Mrs S.B. Chittenden, Mrs J.S.T. Stranahan, Mrs D.C. Robbins, Mrs John Buckingham and Miss Gilbert]. 'A. S. SEER'S Engraving and Printing Establishment, 26 & 28 Union Sq., N. Y.' [Between 5 and 29 March [c.1891]]. 3pp., 16mo. Bifolium. Fair, on aged paper with fold lines. The front page carries the printer's slug, and gives the price of $6 for 'Course Tickets', 'For sale at the houses where the readings are to be given, on and after FEBRUARY 19th.' The middle two pages give the addresses, with owner's names, of the houses at which the six readings are to take place. Royal Adelphi Theatre programme for Doyle's play 'The House of Temperley'. Dimensions roughly 26 x 20 cm. Four printed pages, in a bifolium, stapled into coloured illustrated covers. 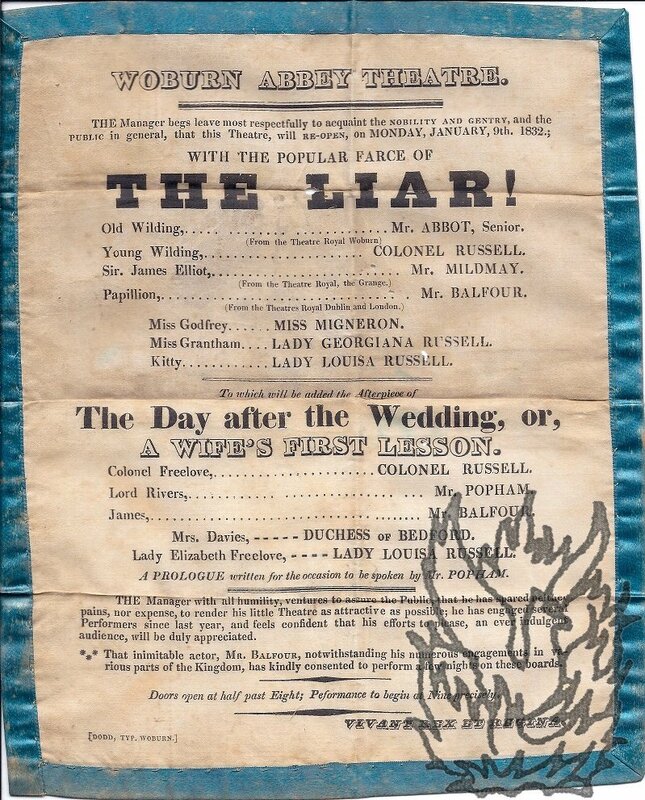 A scarce piece of theatre ephemera, in reasonable condition: creased, with rusted wraps and with one short closed tear to front cover, which carries the words 'Adelphi Theatre. Sole Proprietors, A. & S. Gatti.' and an illustration, painted in an impressionist style, of a fashionable group dining. Stamped 'Saturday Feb 19'. The back cover, also in colour, carries an advertisement for 'Vinolia Toilet Preparations', with an illustration, entitled 'Envy', by 'W. 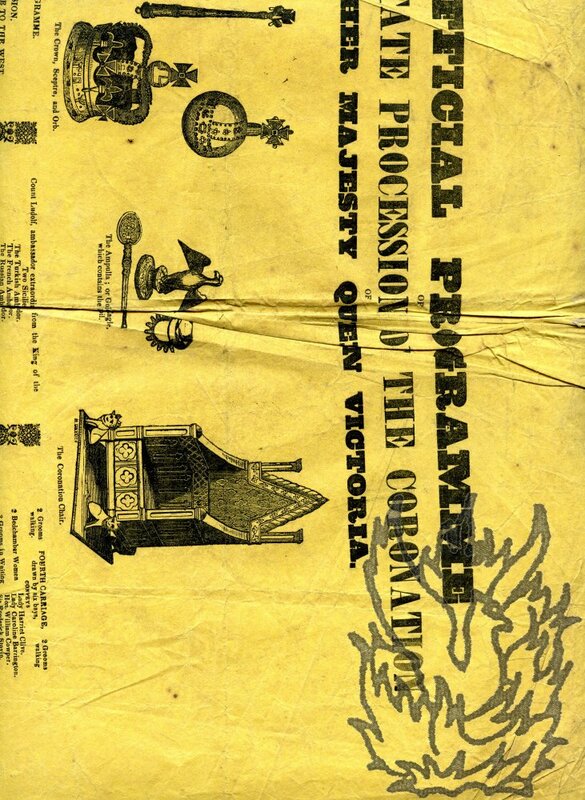 Official Programme of the State Procession of the Coronation of Her Majesty Queen Victoria. On a piece of yellow wove paper roughly 565 x 455 mm. Text and illustrations clear and entire on creased and spotted paper with some wear to extremities. The order of the procession is given in three columns, divided by decorative rules. At the foot is an illustration (120 x 195 mm) of the queen's coach reaching Westminster Abbey, with crowds and a banner reading 'LONG LIVE VICTORIA'. Printed by "Dodd, Typ. Woburn",1832 and 1834. Two programmes, one made of silk or satin (1832), the other paper (1834), former worn at blue edges (main body cream, discoloured to yellowish, fold marks, 2 pinholes and one small hole, c.20.5 x 24cm, latter in good condition, fold marks, c.18 x 22cm. The former announces a production of "The Popular Farce of THE LIAR!" and "the Afterpiece of The Day after the Wedding, or, on 9 January 1832, the cats mixing professionals (Mr Abbott, Mr. Mildmay, Mr Balfour) and amateur (members of the Russell Family). The "Manager" adds a few words, including a special mention for Mr Balfour.